I finished grading yesterday, so the pressure was off to meet deadlines (though I do have a few school projects that can’t slide entirely to the back burner). 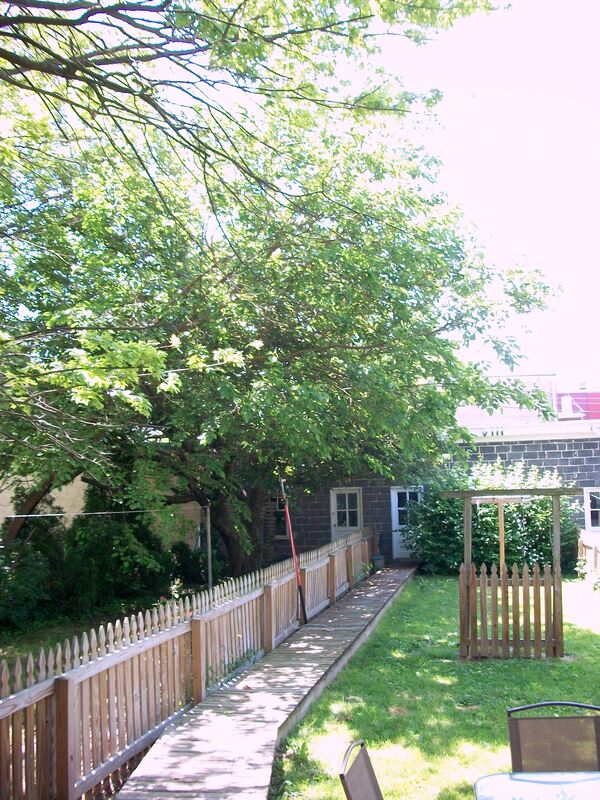 But, several hours of my day today got devoted to tackling some of the trees in the backyard. I have a love/hate relationship with these trees. First, they aren’t my trees, so I can’t make autonomous decisions about them, which really irritates me. The trunks of the trees are in my neighbor’s yard, which means she is the primary stakeholder, but they drop heir leaves in my yard, which means I have to deal with them too. I like some of the shade that the trees offer and enjoy hearing the wind rustle their leaves, but lately, these trees have been making me feel a little claustrophobic. There’s a little too much shade in the yard, way too many leaves to deal with each fall, and two of the trees look like they’re attacking one another because one of them should have never been allowed to grow in the first place. Check out my walkway; I think you can see why I feel a little hemmed in when I leave for work in the morning. If you look really closely at the picture above, you can see some dead looking branches. Unfortunately, I didn’t get to them today because they are pretty high in the air. I don’t blame the neighbor next door for not taking care of this because I know she’s just getting by, but I really wish a tree genie would appear to take care of the tree closest to our houses. The bottom branches don’t get enough sun, so they are pretty dead looking. Notice also how the one tree has grown over so far that it’s reaching halfway into the yard. I mean, it’s nice that the trees somewhat hide the ugly garage, but they also look like they’re mounting a hostile takeover of the yard. 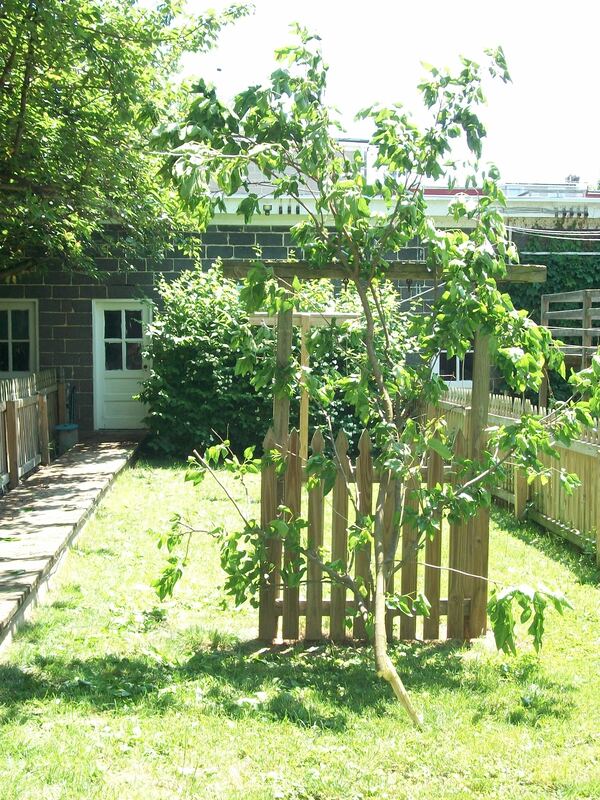 Since it was a beautiful, breezy cool day and since the neighbor (the one on the other side of me) told me I could borrow her tree pruner on a stick, I hopped the fence, grabbed the tree pruner, and got to work. Here’s what the yard looked like when I was done. I used the saw on the tree pruner to cut through a thick limb, which definitely was no small feat. Then, I climbed up on the ladder with my new hand saw to tackle some more limbs. It was intense; I even had to pause to get safety goggles out of the basement after I wound up getting sawdust in my eye. Yes, I do own safety goggles. A girl’s gotta be prepared. 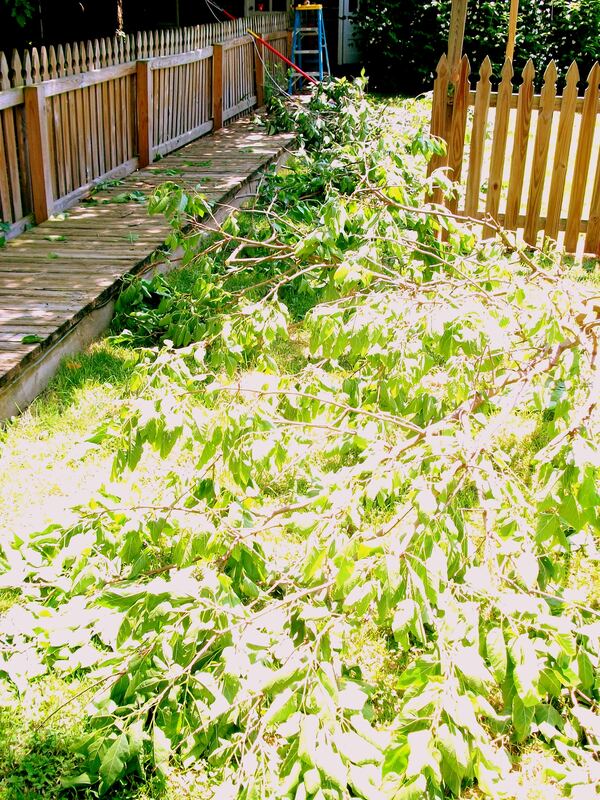 I kept sawing and pruning away until I think I audibly heard my neck speak my chiropractor’s name. I still have some more trimming to do, especially since the tree closest to the garage has grown some limbs too close to the garage roof. I think I’m going to actually have to get on the roof though to take care of that though, so I’m going to wait until my dad or someone else can be here just in case the venture goes awry in any way. For today though, I’d say I made good progress. Here’s that giant limb that I cut down. It’s chilling out by the clothesline, waiting to be cut up, so I can put it out by the curb.